My daughter just turned six. She’s in kindergarten and in my opinion, she’s as smart as a whip. But do all Mom’s say that? But I’m serious. She really is too smart for her own good sometimes =o) She’s learning how to read now and it’s amazing how quickly she is catching on to all the rules, etc. At the beginning of the year I put little notes in her lunch box every day. She would come home and say “Mom, could you not do that please.” Well, at least she said please. But now that she is learning to read she is asking for more notes in her lunch box. So I write little things like “have a good day. I love you” and stuff like that but they are getting a little boring in my book. So I decided to surf the web for more exciting and fun lunch box notes. And man, did I find some great ones. I printed them all out, cut them out and stuck them in an envelope in the kitchen. So every morning when I make her lunch I pull out a new “note” to give to her. She LOVES it! And how easy is that?! It amazes me that my just-turned-6-year-old can text so well. Here’s a word for word conversation she had last night with a friend from out of town…. Scott: what are we going to play? Scott: do I have to run? Scott: oh man… how far? Scott: What if I get tired? Scott: can I stop and rest? Scott: what if I pass out? What a fun post! I am SUCH a note-in-the-lunch kinda woman. 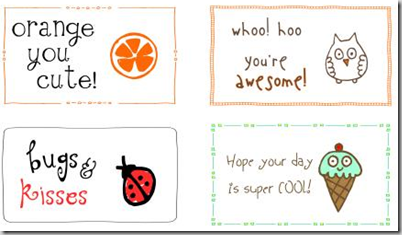 These printables are darling! Early in our marriage, I put a note inside the sandwich of my hubby (what was I thinking??) and he ate half of it before he realized it was there. *-* I didn’t do that again…but do LOVE leaving little notes – even around the house. Thanks bunches and bunches for sharing! Awww – I love these!! What great ideas! That is awesome texting! So funny! Thanks for sharing the printables. Following from Local Fun For Kids. yeah!!! she is a genius! you have why to be so proud!!! And certainly your kids have a lot of reasons to be proud of their mom! So kind! Lovely! 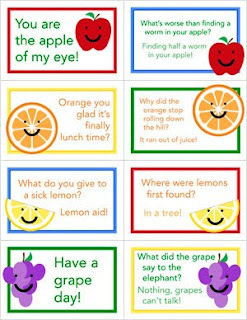 Love the notes, especially the Orange and grape ones! Wow..talk about genius and so funny. I am glad you got this conversation in the book for history sake. Love the notes. This is so fun!!! she is really smart indeed! I loved the lunch notes! How fun! It amazes me how our kids are so very technically advanced. I think adding these great notes to their lunches is a way to stay in touch with them in such an hurried, distant society. Great idea. I am definitly going to print these out and start adding them to my kids’ lunches. What a great way to give them a “hug” in the middle of the day. Thanks so much for sharing and for linking up at Shindig Saturday. Can’t wait to see more great ideas. I will have a kindergartener next year, so I have bookmarked this post. What a cute bunch of messages for lunches! Did you see the post I did a while back on Lunch Box Love? Great ideas here. Thanks so much for sharing this at For the Kids Friday! I’ll be posting the next link party tomorrow night. I hope to have you stop by and share again this week! They are going to LOVE them too! Thanks! I love leaving notes in the lunch boxes for my kids. Love the preprinted ones, much cuter than my post it notes! Hi! Thanks so much for the printables. I tried to email you directly (don’t want it to appear that I’m interested in self promotion), but I didn’t find an address. I did include your printables as one of my Friday Finds this week on my little blog: http://figgsandsuch.wordpress.com Totally agree with Daycare Headquarters — these printables are much cuter than post its, for sure. Thanks again for sharing! Love your post. ~Fun~ stuff! !